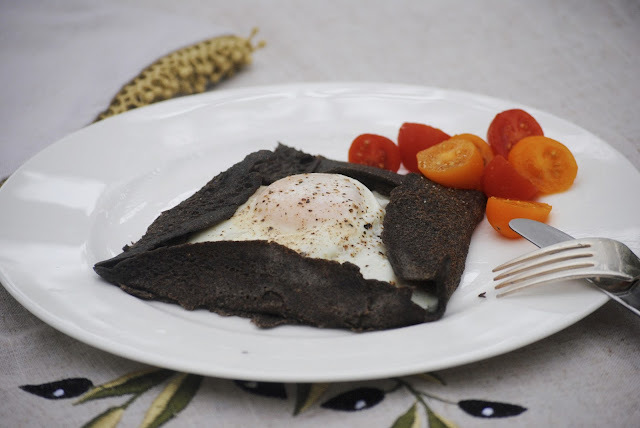 This week for CooktheBookFridays we chose Buckwheat Crêpes with Ham, Cheese, and Egg. Not just any crêpes; we made galettes. David explains they are called galettes when made with buckwheat flour. 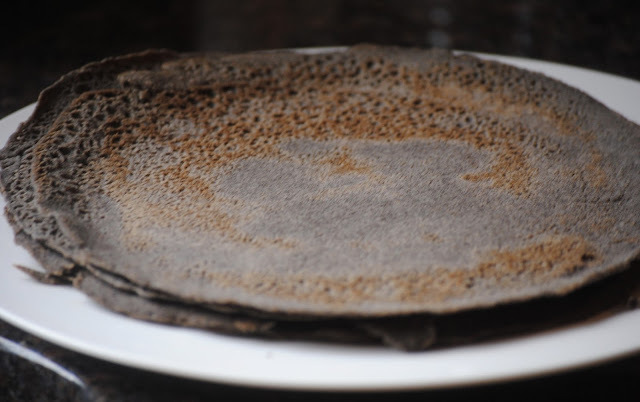 I have never used buckwheat for crêpes. They were a bit of a challenge. The first three I made broke into pieces and wound up in the trash. I then realized I was cooking them on too high a heat and not long enough. When I lowered the heat and used a little less batter, the crêpes came out better. I own two crêpe pans. Neither one is a 10-inch. I made an executive decision and decided to go with the 9-inch., rather than use a larger frypan. I thought it wouldn't make much of a difference...however, getting it to fold was not pretty. I also found the batter very dark. After some research, I discovered that there are dark and light buckwheat flours. Guess which one I have? The finished product almost looked black. When I put them back into the frypan and added the egg, they became even darker. I broke the yolk on the first one, trying to center it...but the second came out perfect. It took quite awhile for the egg to cook. I finally slid the crepe onto a plate and put it into the Microwave for 10 seconds. I really don't like runny whites! Then, while writing this post and looking for a recipe I could share, I found King Arthur's recipe for buckwheat crêpes. They say to fry the egg separately in another pan...now that makes sense. I tried this method with some leftover crêpes and it actually worked much better. My husband oohed and ahhed about this dish. Definitely, man food! And perfect for brunch or even lunch. CooktheBookFridays is a group of bloggers cooking through David Lebovitz cookbook, "My Paris Kitchen". 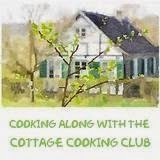 If you'd like to join us, Visit our page, buy the book and cook along. This recipe from King Arthur is very similar to David's. He uses water and this one uses milk and water. Dark buckwheat batter...very strange looking! I will be buying some light buckwheat flour to try these again. My husband loved them. When you're ready to make the crêpes, thin the batter with water, using less water for thicker crêpes and more water for thinner ones. Yield: 10 to 12 crêpes. To prepare a traditional Galette Complète, place your crêpe pan on medium heat, and when the pan is hot, place a crêpe on the pan to reheat on one side. Flip the crêpe and top with 2 tablespoons grated Swiss cheese and a thin slice of cut ham. David's recipe uses Prosciutto. Cook until the cheese is melted and the underside is browned. In a separate pan, fry an egg to the desired doneness. Place the egg in the center of the crêpe, then fold the edges towards the center to make a square. Serve immediately. Oh wokey.. now we know.. I thought my buckwheat flour was not 'pure'... strangely.. my hubby likes the crepes too! I always love the earthy nutty taste of buckwheat. This looks sensational. You've made great adjustments to the recipe and they worked out well. The dark color is uniquely buckwheat and I like that a lot. Enjoy your summer! Interesting, now you have me wondering if there is a big taste difference between the light and dark buckwheat flour. I'll have to keep an eye out and for the dark stuff and do a little test one of these days. Sounds like most of us had a learning curve with the crepes, but looks like you mastered them in the end. an interesting recipe but unfortunately it didn't work out for me with the egg. Next time I will try a fried egg, I think that would be easier. Enjoy your vacation. Interesting about the flours! I didn't know. But did wonder about the varying colors in the photos I've seen. And I agree about the egg. Little did I know that it was "ok" to do that. :) I resorted to the broiler to get mine to set. These were yummy. Not sure I'll be making them again (though I still have about half of the batter still in the refrigerator). Yours look wonderful. I think my buckwheat was dark too, but it was the only kind they had for sale. I always find that things made with buckwheat look a little bit blue. These crepes were no exception. I like the idea of cooking the eggs separately because it took a long time for the whites to set on top of the ham and cheese. Have a great weekend! Thank you for sharing the recipe! Your photos are fantastic! Enjoy your holidays! ooooooooooh, now this is making more sense. I wonder what is the difference between the dark and light, beyond flour? 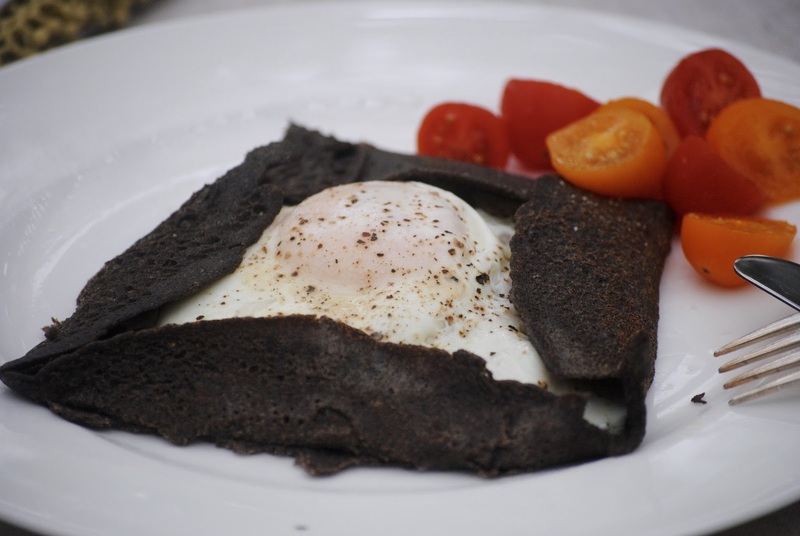 I too had the dark buckwheat flour and it was nearly black! I was wondering why it looked so different! This is utterly fascinating. Thanks, Kathy, and thanks for doing the research on the egg cooking thing, too! Looks like a meal we would love! Can't wait to try it. I must have purchased the lighter buckwheat flour from Bob's Red Mill because my galettes are lighter than yours. I didn't know there was such a thing as light and dark. My first galette broke and was quite crispy. From then on I had no trouble making them. However, folding them into the egg mixture was not easy. The galette was too crispy for bending. I don't mind a runny egg but it was difficult to even get it to an acceptable stage before folding it. I like the idea of this but may use a different mixture in the middle next time. I used a bigger pan and found it made things easier. 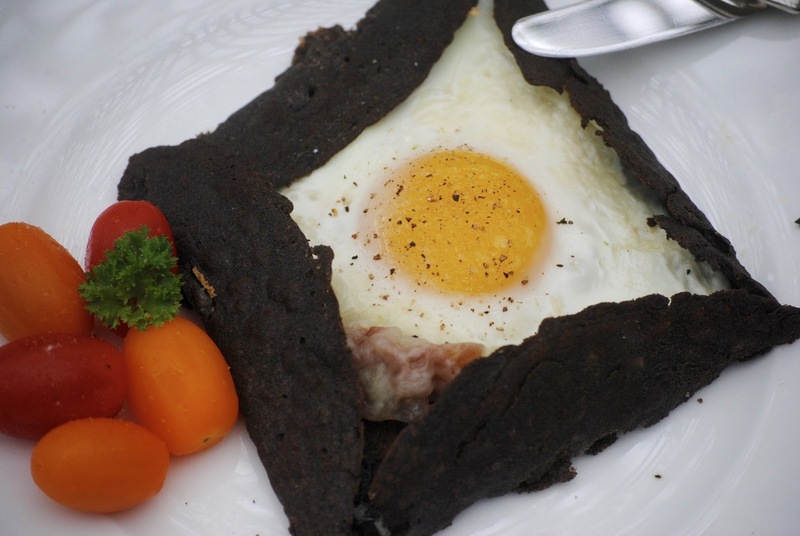 I do like the way your dark buckwheat galettes look. So striking! My sister gave me some buckwheat flour years ago and I, too, decided it was a challenge to work with. I'm sure your almost-black look would be perfect for something--Halloween maybe?? I had no idea that the flour came in light and dark. Wow! That's so different! Glad they tasted great! I really liked them too.